Dogs and cats have fresh breath and relatively white teeth when their mouths are clean and healthy. We recommend a yearly dental exam to evaluate the teeth, gums, and associated tissue structures. 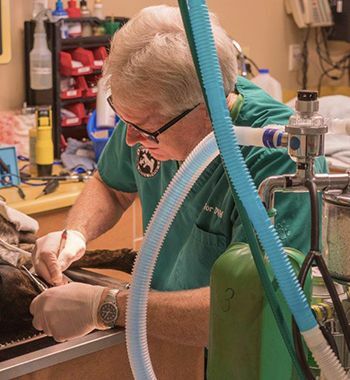 Our veterinarians will provide a dental exam as a part of your pet’s normal annual exam. Based upon that exam, your veterinarian may recommend a dental cleaning. Not all pets will require an annual dental cleaning though some, especially small breed dogs, may require very frequent cleanings. Foul breath is one sign of serious dental disease. Pets that eat on only one side of their mouths or no longer enjoy chewy treats may also be suffering from pain and infection associated with abscessed teeth. 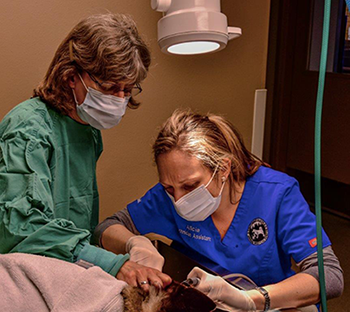 Dr. Lisa Kramer and veterinary technician, Alicia Jackson, discuss a possible tooth root abscess during a recent dental cleaning. Dental cleanings are performed under general anesthesia, since dogs and cats don’t sit still for dental work. At times, we will also recommend bloodwork to assess the overall health status of your pet. We will provide an estimate for the cost of procedures, including pain medications and antibiotics for after care, prior to proceeding. We will also provide information on an at home dental care routine that can help clean mouths stay healthy. 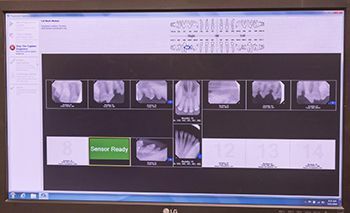 LVT Melissa Roulette takes a digital dental x-ray. Dr. Pat Taylor prepares to extract a fractured tooth. A full mouth dental x-ray series is available for all interested clients. 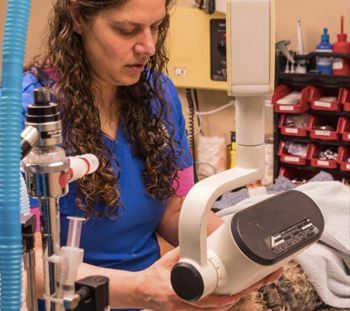 Digital radiography enables your veterinarian to identify dental problems and provide the best care for your pet.